The Hotel Bigallo Florence is a hugely popular Three Star Hotel that enjoys an enviable position right in the Heart of Florence and overlooks the Duomo. The Hotel is only a short stroll from some of the City�s most famous attractions making the hotel an ideal base to discover the Treasures Florence has to offer. The Main Goal was to produce a State of the Art Website that showcased The Hotel's great location and proximity to most of the nearby attractions in Florence City Centre. We targeted the mobile and tablet marketplace with a responsive website that worked across all browsers and devices. The Hotel Bigallo Florence Official Website mirrors the quality of the hotel itself both in terms of aesthetics and functionality. The opening image on the website immediately conveys the incredible position next to the Duomo that the Hotel enjoys. Not only does the website display an interactive map showing the close proximity to the nearby attractions, it also features the WebHotelier booking engine including the Price Comparison widget on the Bookings page. Hotel Bigallo Florence has a state of the art official website that not only wipes the floor with most of its competitors' sites but has a powerful online presence and gives the hotel itself the facilities to navigate successfully in the online market. A antastically well located hotel in one of the world's premier tourist destinations with a powerful online presence, effective communication with its target market across the world and the power to plough its own furrow. 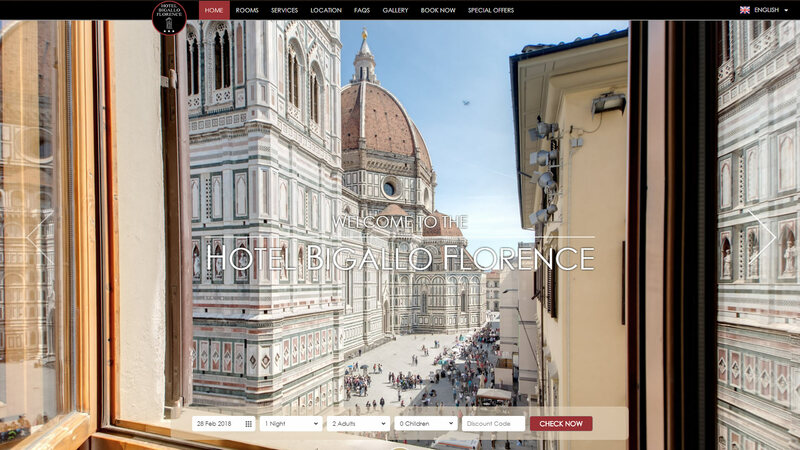 The Hotel Bigallo Florence has a website fitting for such a hotel, combining attractive design with extensive functionality and back office tools that are instrumental in the increased turnover year on year.